While browsing through our AAM Archives, we went through that post and we realised that much of the Archu-feelings of being spurned then were almost similar to the present Archu-feelings of being denied. Even though David is back. Even though the circumstances are different. I am tempted to post a blank page today … what does one do when one is steeped in Archu-silence angst and the ideas to deal with it, are running out? But hang on! All is not lost! There are still some ideas floating about – some of which are Archu-inspired – which might carry you through. Not brilliant ideas but one never knows, these ideas may just create geniuses of us lot yet. 1. The obvious remedy is to play Crush Glorious etc on repeat … and repeat … and repeat … and repeat … and repeat … until your ears or heart or whatever, fall out. 2. Or, if you are the impatient kind, you can fly to Santiago Nashville (or wherever you think he is) and stamp your feet and create a scene outside his Church house?/apartment? and insist on signing on the Release Papers kicking up a big row on the street and that you won’t budge until a certain Elder supposed-to-be Cool Guy but dressed like an Elder, comes out. Then maybe … just maybe … if you are extremely lucky … you will see him for an ecstatic duration of 5 whole seconds minutes (no Displinary Elder here .. and pleeaase do not disturb him when he could be busy writing or recording music!) Woah what a treat! 20. You can write your Memoirs. And call the book “Chords Of Strength Super Exhaustion- The Power Of Endurance Depletion And Tenacity Of Fatigue” You might, with luck, make it to the best-selling list too! 22. For the rest .. I guess you guys will just have to refer to our Archives at Oct 4, 2013. My old brain needs a rest. Celine Dion paid a stirring, emotional tribute at the American Music Awards to the victims of the Paris attacks on November 13, with this Edith Piaf’s “Hymne a l’amour”, moving the whole theatre to tears. The 130 victims in Paris – why should their lives be prematurely taken? And what about the suicide bombings in Beirut? And the downing of the Russian jetliner killing 224 people? And all the thousands who were being killed everyday because of differences of ideology ? Who will sing for them? Who will give them tributes? Alas, my heart feels the blindness of the world already. I watch The Voice now and again. Jordan Smith has been reportedly the frontrunner since the Blind Auditions and the song he sang this week “Great Is Thy Faithfulness”, was indeed an unconventional choice. A religious song has topped iTunes and caused a certain amount of buzz which has stunned many in the music world and the news has made me sit up and think of what David has been inclined to do these months. Jordan Smith sang the 1st verse of that buzz-worthy song a capella, then played the piano as the sole accompaniment. He had a standing ovation at the end of the song. “This performance, it’s a chance to show who I really am,” said Smith. Watching him has raised a few questions in my head. Does David still have a chance to embrace the approval of the listening public by singing religious songs? Jordan Smith seems to have a likeable unassuming persona and, to me, his voice is moderately appealing, especially when he sings a capella. But, frankly, I think he is no David Archuleta. David can sing circles round him. I’m not saying this as a comparison of the qualities between them since we should all be tolerant of everyone else’s preferences. What I am referring to is, why izzit Jordan can get more than 3 million viewers for his vid and David has just a trickle? Is it a case of “new broom sweeps clean”? To go further, why is it people cannot appreciate David’s singing religious songs? And even further, why is David not getting iTunes popularity, religious songs or otherwise?? 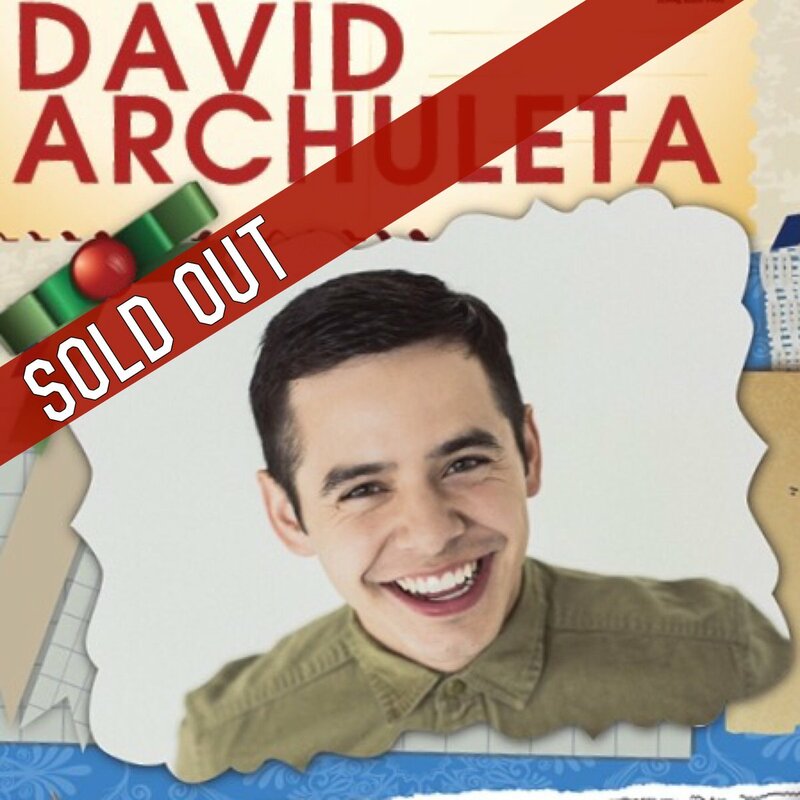 David’s Christmas Shows Sold Out! YESS!! All sold out within minutes! Woohoo! A Super-Sweet Tweet from Davis Arts Council! David and Christmas songs – almost synonymous! This is one of our favourite Christmas vids of all time! I wonder how David will react to a similar situation while performing in the forthcoming Shows at The Halls now that he is all grow-up and elegant and sophisticated (ahem!) Can’t wait for our amazing archie ninjas to drop us some Christmas gems for these shows! But, before we can actually buy new music from him … before the release of NUMB, which he has indicated directly … and before the coming out of the EP, we have been given a dose of what lies ahead through his LIVE performances the past weeks. LIVE performing is a skill that needs to be mastered. Not everyone can successfully do that so that the audience feels not just entertained, but comfortably entertained. I remember when David first came out on his own to give his first LIVE performances, one of our favourite bloggers, Rascal, mentioned that “David is not a natural LIVE performer”. We totally agreed. But he was a keen learner and he soon began to relax to strut the stage a little more from left to right, then from right to left, then back again. He soon learnt that singing and standing still were not inter-related and dependant of each other. BUT this David person now is quite a different story. This David who came back from wherever he went (Religious Mission or Stage Banterings College) is calling the shots onstage! Even when he is lolling about or just simply sitting on a stool, he is as cool as a cucumber! And the audience is lapping it all up! He is the Boss, mate! He is controlling the evening! Just put your heart in his hands and you’d be happy! He definitely deserved full marks in stage bantering in Tuacahn. Watch this! And this for engaging the audience to stand up from their seats and dance and gyrate the evening away with him! Not just the teeny boppers in the front but the whole theatre! Wowza! This aspect is part and parcel of a LIVE performance: to engage the crowd … to draw in their attention … and to give them a good time. The intimacy of the interplay between artiste and audience is most precious and essential. David’s artistry has improved a great deal as well in his LIVE performances. … I did not for a moment, while watching the vids, worry about him not being able to reach a high note. I remember many of us used to worry sick just before one, then sigh in relief after it. The way he twirled his musicality around certain notes was titillating sensations for me … the way he made me suffer my pain in EVERYBODY HURTS and the surprises he gave me as PANDA turned into a dance of rejoicing … he has become a LIVE performer of sophistication … of free self-expression and honesty and less pressure from within. I have always wondered about artistes feeling disconcerted just before a LIVE show: What if things went wrong? … what if the electricity went kaput? … what if there is a sudden downpour in the open theatre? … what if the mind went blank and the lyrics went astray? This last one was one which David had been guilty of several times. But what the heck … nothing can be perfect. We are all human and David is even more so since he is often larger than life. So what if he got carried away by the moment … the important thing is he gave everyone a darn good time!! Not only do we get to hear David’s wake-up morning voice, we get to hear him talk about his new EP and the release of NUMB early next year! Woah!